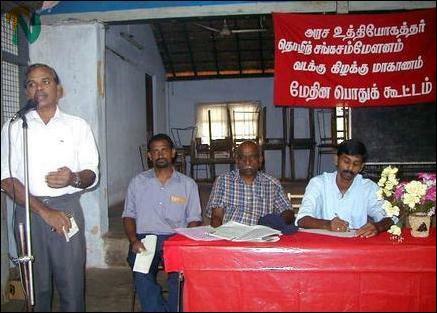 "Tamil speaking workers are not given all the rights that are enjoyed by the majority community workers in the country," said Mr. S.Thandayuthapani, President of the Ceylon Tamil Teachers' Union (CTTU), presiding over the May Day meeting held in Trincomalee Vigneswara Maha Vidiyalayam Saturday. The CTTU and the North East Provincial Government Officers' Federation organized the event. Mr.Thandayuthapani further said although Tamil speaking workers jointly agitate with the other communities to achieve common demands, they should not fail to contribute their share and strengthen the liberation struggle of Tamils in the country. "Tamils have been treated as second-class citizens in the country. The government in the selection of promotions is often neglecting Tamil speaking workers. They are not offered foreign scholarships and other benefits they are legally entitled on par with the majority community workers," said Mr.Thandayuthapani. Tamil speaking workers would only achieve their rights when a just and fair political solution is found for the Tamil national question, he stressed. CTTU General Secretary, Mr.T.Mahasivam, said that at the last general election about ninety five percent of Tamils have given a mandate to the Tamil National Alliance to demand for an Interim Self Governing Authority (ISGA) for the northeast province. The provincial council system, which was introduced as a solution to the Tamils' problem, is now effectively functioning in the other seven provinces where Sinhalese are in majority except in the Tamil dominated northeast province, Mr.Mahasivam said.